5 months after getting Love at First Stitch, I've finished every pattern in the book! Ok, almost everything - I skipped the blouse, as it looks a bit loose through the waist and I know I would never wear it. (Fitted tees for life.) But I did make three of one skirt, and redid another one to fit me better, so it evens out I think. Here is the first round of clothing that I made! The first pattern is a simple hair scarf, which I made in red... and was promptly reminded that I cannot pull off head scarves (something about my head shape? or hairline? they sit awkwardly and then slide off). A good refresher if you haven't touched your sewing machine in years, though. Next - PJ pants! these are pretty great, although I do wish they had elastic instead of just a drawstring. Another good beginner project, though, and a great intro to clothing without having to worry too much about fit. Details: Drawstring, hems, and inside zigzag stitches in lieu of a serger (gotta finish those seams so they don't unravel). My first invisible zipper (or, actually, any zipper! ), and a rather fancy finished waistband. This was probably my first "holy crap, I made this?!" moment. 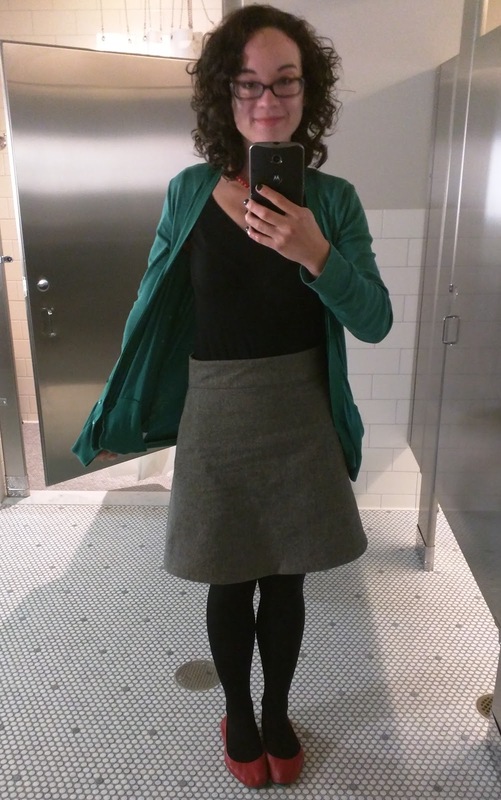 My first time wearing something I'd made to work (aside from knit hats... but those are more accessories). Had to commemorate with a bathroom selfie. More to come - two rather complex dresses (so many darts!) and three color variations on another skirt. Stay tuned. 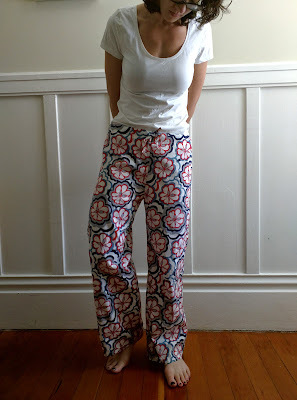 These PJ pants taught me a ton of new things: pre-washing fabric; tracing a pattern and cutting out the pieces; fitting together a 3D garment; seam allowances and finishing seams; pressing (not to be confused with ironing.. although it's similar); hemming. The Delphine taught me: making a toile to fit; inserting a zipper (an invisible one, even! ); using interfacing to stabilize; creating a finished waistband. Also - being picky enough to redo it if it's not just right, because sewing my own stuff gives me that power.